Passing Daisies: Daring Bakers: Croissants Galore! Welcome to another Daring Baker's Challenge! This month... CROISSANTS. After reading the recipe, I was a little scared that these guys would take 12 hours to make. That's a LONG time, especially in a dorm room. But you know what? It's a challenge. So I'll take it on! I made a few different types of croissants: original, bananas foster, and apple butter with almonds. No, I've decided I'm not going to post the recipe for this. It's long and complicated, and if you want to see how Julia Child does it, you can watch her video HERE. All I can say is: WOW. These were flakey, buttery, and delicious. Definitely could NOT tell that they were vegan, considering the only difference was using Earth Balance for butter and almond milk for regular milk! I filled some with my bananas foster filling, using a mashed banana, cinnamon, and brown sugar. I sprinkled the tops with cinnamon sugar. This was my favorite flavor. 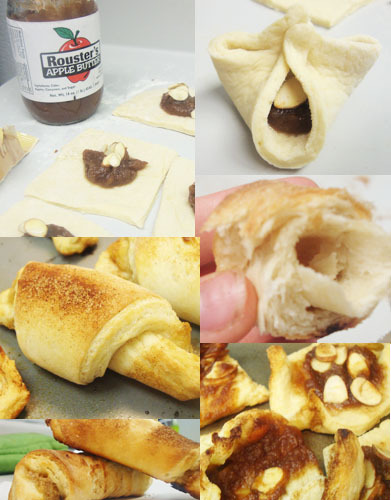 Others I filled with apple butter and almonds and made them into little packets. I used apple butter mostly because it's fall and my desire for fall foods (pumpkin, apples, cinnamon, apple cider, pie, etc...) is kicking in. I love fall! I highly recommend that you all take the time to try making this beautiful things. 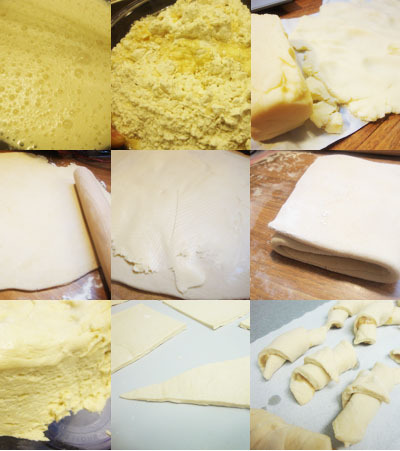 The layers in the dough that you can see after only folding it and letting it rise once (you do this like, 10 times!) is ridiculous. I love that you can pull apart the layers. Food is beautiful. Thanks for the [successful] challenge, Daring Bakers! Bananas foster filling? You are speaking my language! Your croissants look fabulous, great job making them and vegan-izing them! YUM!! The bananas foster filling sounds SCRUMPTIOUS, and like a great pairing with the beautiful, flaky croissants. Really awesome job!! Those look beautiful! What great flavors as well. Nice job on the challenge! What banana foster flavoured croissant I LOVE it wonderful effort and you did it in a dorm even more impressive. Cheers from Audax in Sydney Australia. Wow, I've never heard of bananas foster before. Sign me up for some of that! Your croissants look delicious. I love autumn flavours too. Best time of year! WOW! Your croissants not only look utterly perfect (and great job on the flavors!) but you made them in a dorm room?!?! You Rock! I must second that sentiment; making these in a dorm room definitely puts me to shame for moaning about doing them in my own kitchen. They look delicious - outstanding work!